The New Directors / New Films (ND/NF) program at The Museum of Modern Art (MOMA) and The Film Society of Lincoln Center is always one of the most interesting film programs of the year. The films come from all over the world, and are the work of a new group of filmmakers, here caught at the beginning of their careers. This is the chance to discover the New Filmmakers who will become the Famous and Important Filmmakers of the future. Take a moment, or more than a moment, on the way to the MOMA theater to stop and view the timeline of ND/NF over the years and meditate on the quality of this event. Among the special features of this festival is that many of the filmmakers come to present their work, and talk about their work in a Q & A after the film. Among the directors expected to attend are J.C. Chandor, director of MARGIN CALL, the Opening Night film about power banking, with the power cast of Kevin Spacey, Paul Bettany, Zachary Quinto, Demi Moore, Stanley Tucci and Jeremy Irons. Other directors expected to appear with their films are Paddy Considine, director of TYRANNOSAUR, and Maryam Keshavarz, director of CIRCUMSTANCE, the Closing Night film. In fact, nearly every director (except Hongqi Li from China -- WINTER VACATION) is expected to attend. In addition... Courtney Love, Eric Erlandson and Melissa auf der Maur will join former HOLE bandmate Patty Schemel for the New York debut of the rockumentary HIT SO HARD! 8:00pm FWD: UPDATE ON MY LIFE + SHUT UP LITTLE MAN! 3:30pm FWD: UPDATE ON MY LIFE + SHUT UP LITTLE MAN! Diab's "6,7,8" intersects the stories of three women of very different social and economic status in Cairo as they converge in their collective desire to combat sexual harassment. A wealthy, secular young woman who is molested at football match is revealed to be just as vulnerable as the devout Muslim wife of limited means who must ride the bus with marauding men. Given the cultural and religious implications of family life and gender division, the women look to collective action, the media and even violence as routes to freedom. Marais’ AT ELLEN’S AGE catches a woman at a crossroads following her husband’s confession of having an affair and the loss of her job due to a subsequent panic attack. The film follows the woman’s awakening after she joins forces with a group of animal activists. Tsangari’s ATTENBERG is a fun melding of (new) Nouvelle Vague, musical, melodrama, and nature documentary, symbolically visualizing a change of generation and perspective as a father and daughter gently negotiate their individual rites of passage. The film follows a visionary architect who has come home to die in the vanishing industrial town that is his legacy to his daughter. Meanwhile, his daughter (played by Ariane Labed, in a performance that garnered her the Best Actress award at The Venice Film Festival) is exploring the mysteries of kissing with her girlfriend and the beyond with a visiting engineer. Zlotowski’s BELLE EPINE is a coming of age story about a teenage girl dealing with the death of her mother and absentee father. The girl loses herself in antisocial behavior, turning away from her Jewish heritage personified by her supportive aunt and uncle, and drawn into the orbit of a wrong-side-of-the-tracks classmate and her biker friends, who gather for chaotic, sometimes lethal night-time motorcycle meets on the edge of town. Olsson’s documentary utilizes never before seen interviews (with Stokely Carmichael and Angela Davis among others) filmed by a group of Swedish filmmakers from the late sixties to mid-seventies to chronicle the growth of the black power movement. Thirty years later this lush collection of 16mm footage was found in a basement - and combined with additional commentary by artists and activists who were influenced by the struggle – from Harry Belafonte to Erykah Badu - becomes a powerful chronicle of the birth and life of a movement. THE BLACK POWER MIX TAPE 1967-1975 is a Sundance Selects release. Keshavarz’s searing feature debut CIRCUMSTANCE follows two young Iranian women as they live life in the shadow of the regime, going to parties and listening to forbidden music while starting to explore their true feelings for each other. CIRCUMSTANCE recently won the Audience Award at the Sundance film festival. CIRCUMSTANCE is a Participant Media and Roadside Attractions release. Fitoussi’s second film, COPACABANA is a gentle French comedy about the relationship between a daughter and her single mother, starring real-life mother and daughter Isabelle Huppert and Lotlia Chammah. Embarrassed by her mother, the daughter wants a ‘settled’ life, something she believes her mother is not capable (nor desiring) of achieving. So her mother sets out to prove her daughter wrong, and win her respect by selling time-shares in a seaside resort town. Set in the dead of winter, Côté’s CURLING is a tense and darkly comic portrait of a family in a rural Quebec village. The film follows a single father as he seeks to isolate his adolescent daughter from the outside world for fear that it will scar her as much as it has him. CURLING earned Côté the Silver Leopard for Best Director and Emmanuel Bilodeau the Leopard for Best Actor at the 2010 Locarno Film Festival. Albright’s drama THE DESTINY OF LESSER ANIMALS follows a Ghanian Police Inspector as he embarks on a dangerous journey through modern Ghana to retrieve his stolen counterfeit passport. Finding his own search linked to a series of violent crimes, he joins forces with a seasoned police veteran who is still optimistic about his country to solve the mystery. Kott’s GROMOZEKA is his follow-up to THE FLY, which was a selection at New Directors/New Films in 2009. The drama follows three men who played in a pop-music trio during their high-school days, and are now three middle-aged men in different walks of life—surgeon, police officer, taxi driver,living at different levels in Moscow’s socio-economic structure. Aside from their annual reunions, which book-end the film, their lives intersect only glancingly and unknowingly as their respective personal discontents and professional troubles reach crisis points and presents the contrasting ways in which each of them tries to cope. Switsky's directorial debut, HAPPY HAPPY is a comedy about a thirty-something couple with a young son, living a rather dull life in the Norwegian countryside. Then new neighbors move in next door, and while at first glance they seem to be their mirror image and perfect friend material, the differences that do exist (the new couple's son is an adopted African, the husband is full of sexual energy, and the wife is...Danish!) manifest in increasingly disturbing ways. The film was the winner of the Grand Jury Prize for World Cinema at the 2011 Sundance Film Festival. Ebersole’s rockumentary HIT SO HARD is a pull-no-punches portrait of the hell-and-back life of Patty Schemel, drummer for Courtney Love’s band Hole during its peak years. The result is an unprecedented inside look at the one of the Nineties most crucial and controversial groups. Notwithstanding its amazingly candid interviews (Love included), its unflinching accounts of the personal tragedies that plagued the band in its heyday, and a rare look at hardball music-industry politics gives the viewer the lowdown on the recording of Hole’s 1997 record Celebrity Skin. Set in the confines of downtown Tokyo, Fukada’s comedy HOSPITALITÉ is about a man living a mundane life, running a small printing factory and living a quiet life upstairs with his wife and children. Then a man arrives claiming to be the son of a wealthy financier who once helped his business. Soon the stranger has moved in with HIS wife, is running the business, and soon invites guests of his own – a large, eclectic and exotic group – into the apartment, destroying the once orderly and comfortable life of his host. Villeneuve’s film, INCENDIES focuses on twins grieving their mother’s death who have their world shaken further when the reading of her will reveals that their father, presumed to be deceased, is actually still alive and that they also have a brother. The film follows the twins as they seek to fulfill their mother’s final wish – for them to find their father and brother and deliver to each of them a sealed letter. A Sony Pictures Classics release. Yüce’s MAJORITY features Barta Küçükçaglayan as a man that manages to slide through each day working as an office assistant for his father's construction company when not gobbling burgers at the mall with his buddies. That is until he meets a shy but charming Kurdish girl, and suddenly his entire approach and outlook to life begin to change. However, he now must face a new conflict with his parents...upon whom he is completely dependent, and who won't even consider their son settling down with a Kurd. Zoabi’s feature debut, MAN WITHOUT A CELL PHONE, is a comedy about a young Israeli construction worker with little ambition other than to have fun with his friends and meet girls which is directly at odds with his father’s ambitions to bring down a cell phone tower he is sure is poisoning their Arab neighbors with radiation. 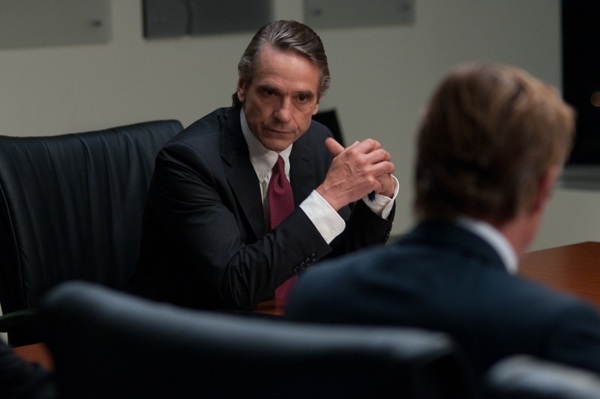 Chandor's timely and terrifying dramatic expose, MARGIN CALL tackles twenty-four hours on an investment bank trading floor; a day that brings layer upon layer of human and professional wrongdoing that jeopardizes the entire fabric of the banking system. An all-star ensemble cast, led by Kevin Spacey, Paul Bettany, Zachary Quinto, Demi Moore, Stanley Tucci and Jeremy Irons, propel this ominous day toward the abyss, preserving just enough pathos to allow us to ultimately recognize these bankers' humanity. Hers’ MEMORY LANE is a film about characters caught "in between"-between city and country, friendship and love, life and death, and youthful dreams and the impending realities of growing up. Setting in motion several story lines, Hers allows action to develop and characters to emerge through subtle gestures, quick looks and offhand remarks via a splendid ensemble of actors that truly create a sense of closeness, a kind of familiarity that need not be emphasized as it's always so present. Abdalla’s MICROPHONE stars (and is co-produced by) Egyptian heart-throb Khaled Abol Naga as a man who returns to his hometown Alexandria unmoored and restlessly searching for purpose beyond his ex-girlfriend who’s no longer interested and his aging father from whom he feels terminally alienated. Wandering the streets he happens upon a music and art making group of younger people that he stubbornly pursues and eventually becomes part of as his self-involvement changes into a real connection with this new world. Co-directed by brothers Daniel and Diego Vega, OCTUBRE follows a small-time money-lender living in a Lima barrio who one day discovers a baby left on his doorstep. To care for the child--the product of one of his frequent liaisons with prostitutes--the man engages a female neighbor for help, and soon a new, unexpected family is formed. The film won the Jury Prize of the "Un Certain Regard" section of Cannes 2010. OCTUBRE is a New Yorker Films release. Apetri’s OUTBOUND is a tense race against time as a young woman, serving a five-year prison sentence for a crime she didn’t commit, attempts to right the wrongs done to her, collect on debts and cleanse herself from her past life after she receives a day pass so that she can attend her mother’s funeral. Executive produced by Spike Lee, Rees’ debut feature PARIAH, is a character study of a seventeen year-old New Yorker (played by Adepero Oduye) whose efforts to explore her lesbian desires are squarely at odd with her middle-class Brooklyn family – and more specifically, her church-going mother (played by Kim Wayans). The film draws an affectionate portrait of a community, one so close everyone knows everyone else’s ‘business’, and dramatizes the longings, disappointments and achievements of a teenager whose ideas of femininity are less traditional than most. A Focus Features release. Bate’s documentary SHUT UP LITTLE MAN! AN AUDIO MISADVENTURE tells the story of two men who, upon discovering they had rented an apartment next to two men who drank and verbally abused each other every night, decided to record the nightly fights and play them back through their neighbors’ front door. It didn’t quiet the noisy roommates, but somehow the recordings became part of an underground culture that still inspire musicians, poets, graphic artists and disc jockeys. Pereda’s SUMMER OF GOLIATH combines documentary and fiction as it intertwines the stories of people living in a small town in rural Mexico. Those people include: a woman who believes her husband has left her for another woman; her soldier son, who hopes that one day he and his soldier partner will be issued machine guns so that they may intimidate passing motorists; and three brothers whose father left them many years ago in the care of their mother, who can barely support them. Actor Considine makes his directorial debut with TYRANNOSAUR, an intense drama about a lonely man with a violent temper and a knack for getting into situations, particularly at pubs, that leave him and others bloody. However, he has a soft spot for a young boy who lives across the street with his feckless mother and her punk boyfriend. Beyond that, he knows better than to seek anyone else’s company until he meets a clerk in a church thrift shop who has some problems of her own. TYRANNOSAUR is a Strand Releasing film. Almada’s documentary EL VELADOR displays the world of "El Jardin,", a cemetery in the drug heartland of Mexico. Since the war on drugs began in 2007, the cemetery has doubled in size and some of its mausoleums have been built to resemble gaudy cathedrals, creating a skyline that looks like a fantastical surrealist city more than a resting place for the deceased. The film introduces us to both the lives of the cemetery workers and families of the victims - in the shadow of an increasingly bloody conflict that has claimed nearly 35,000 lives. Hongqi’s WINTER VACATION is a deadpan comedy about four teenagers during the last day of their winter vacation as they face the prospects of having to return to school and their studies. The kids argue, debate and fight as the clock ticks away on their holiday and they deal with their love lives and question school's value and relevance to real life. WINTER VACATION won the Golden Leopard for Best Film at the 2010 Locarno Film Festival. FWD: UPDATE ON MY LIFE will screen with SHUT UP LITTLE MAN! Screening locations are noted below next to the film titles.